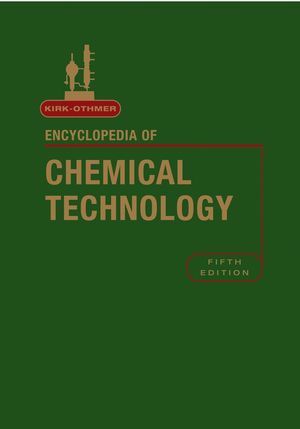 The fifth edition of the Kirk-Othmer Encyclopedia of Chemical Technology builds upon the solid foundation of the previous editions, which have proven to be a mainstay for chemists, biochemists, and engineers at academic, industrial, and government institutions since publication of the first edition in 1949. The new edition includes necessary adjustments and modernisation of the content to reflect changes and developments in chemical technology. Presenting a wide scope of articles on chemical substances, properties, manufacturing, and uses; on industrial processes, unit operations in chemical engineering; and on fundamentals and scientific subjects related to the field. The Encyclopedia describes established technology along with cutting edge topics of interest in the wide field of chemical technology, whilst uniquely providing the necessary perspective and insight into pertinent aspects, rather than merely presenting information. "The most indispensable reference in the English language on all aspects of chemical technology...the best reference of its kind". "Overall, ECT is well written and cleanly edited, and no library claiming to be a useful resource for chemical engineering professionals should be without it." Kirk-Othmer is the editor of Kirk-Othmer Encyclopedia of Chemical Technology, Volume 26, 5th Edition, published by Wiley. Alkanolamines from Olefin Oxides and Ammonia. Allyl Alcohol and Monoallyl Derivatives. Aluminum Halides and Aluminum Nitrate. Aluminum Oxide (Alumina), Calcinated, Tabular, and Aluminate Cements.